Share "Winter Poultry Care Tips"
Whether you have chickens, ducks, geese or turkeys, poultry is well-equipped for winter weather and colder temperatures, but with a few easy steps you can help ensure their good health and happiness all winter long. When temperatures dip, birds – whether wild birds, domestic pets, or agricultural poultry – have many ways to keep warm. They fluff their feathers to create insulating air pockets next to their skin, and they position themselves in sunny spots to absorb heat. They may tuck their bills or feet into their feathers to minimize heat loss, and they can adjust their metabolism at night to consume fewer calories so their fat reserves last longer. Birds even huddle together to share body heat, and they shiver to warm their cores. With all these adaptations, poultry doesn't need a great deal of extra care in winter, but a few simple techniques can keep them healthy and secure. Winterize their coop, shed, or barn in autumn. Plug drafts, repair roof leaks, and be sure ventilation is adequate, preferably with vents near the top to keep air circulating. Humidity from birds' breath and ammonia from decaying feces can create frostbite and respiratory problems, but these steps minimize that risk. Add a thick (3-6") layer of straw, sawdust, or wood shavings to the floor. Not only will this provide insulation for the birds' feet, but it will absorb feces better and is easier to clean. Check that birds have enough roosting space inside the shelter, and if necessary, add more shelves or perches. Straw bales around the edges of the shelter are ideal, and will provide more insulation besides. Add a supplemental light to the coop if you want to increase egg production throughout the winter. Ducks and chickens need 10-14 hours of good light to be stimulated to lay eggs, and while winter laying will still be lower than at the peak of summer, a light source can help. Opt for a heated water bowl or heated bird bath if water dishes may freeze. Ducks may also need occasional tubs for bathing, but they do not need daily access to deeper water if freezing is a problem. Adequate water is essential throughout the day, so be sure water will not freeze even if left untended during the coldest temperatures. Protect poultry from winter-hungry predators by screening holes in the coop where weasels, rats, foxes, and other predators may find access, and provide a safe outdoor run that is protected from hawks and larger predators as well. 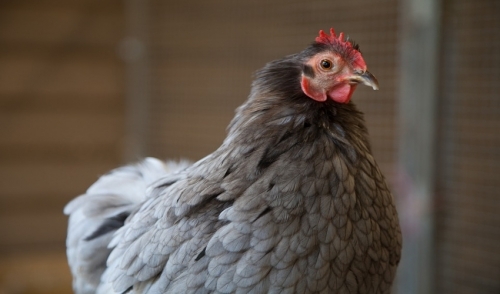 A motion-activated light can be useful to help protect a coop at night. Winterize pens by making any necessary fencing repairs, and use plywood or other material to create a screened corner or several A-frame shelters that can serve as windbreaks on cold days. Add a few stumps or low benches throughout the pen for easy perches where poultry can get out of the snow. Gradually increase feeding, providing slow-digesting foods such as cracked corn or grain for chickens or peanuts for ducks in the late afternoon. Poultry will fill their crops with these foods before roosting, giving them an energy source to sustain them through the coldest nights. Be sure there is enough activity to keep the birds healthy by providing a scratch area for them to visit and brushing snow off different roosts and perches. Hanging a cabbage or lettuce head can give them something to peck, and scattered greens such as kale and chard are healthy supplements as well. Consider rubbing chickens' wattles and combs with petroleum jelly to provide a barrier against the cold and protect them from frostbite. This may need to be reapplied regularly, but can be effective without harming the birds. The most important thing to do to care for winter poultry is just to watch them carefully for signs of illness or discomfort. Some winter days are worse than others, and adjusting your care to meet the birds' needs is the best way to keep them happy and healthy all winter long.